The closer we get to April, the more likely it is we’ll be receiving that invite to visit Cupertino to see the next generation iPad announcement. Until then, the rumor-mill is firmly in overdrive. The problem though, is which rumors should you believe, and which are just link-bate? Keep on reading for our roundup of iPad 2 (and even iPad 3!) rumors. With the iPhone 4 sporting the famous Retina Display, many have (wrongly) assumed that the next iPad will also come equipped with a mind-boggling array of pixels – but as we reported recently, it’s looking increasingly likely that the new screen will be, well, old. By that I mean the resolution and size will be exactly the same as the current model if the part 9to5Mac got hold of is anything to go by. Slightly disappointing perhaps, but entirely expected. One rumor that just won’t go away is the possibility of a new, smaller / thinner form-factor. Reports claim that a 7-inch model is in the works, with Apple looking to enter a market where Samsung is the current number one with its Galaxy Tab. RIM’s PlayBook also sports a 7-inch screen, though the upcoming Android tablets all seem to be going for a larger screen, with Samsung’s new Galaxy Tab 10.1 using a 10.1-inch panel. Two weeks ago, The Wall Street Journal reported that the iPad 2 was already in production, citing ‘people familiar with the matter’ as saying that a deal with Verizon was in the offing, with both GSM and CDMA hardware on the way. Recently, an exclusive report by Engadget revealed that the second generation iPad will have dual GSM/CDMA chipset produced by Qualcomm. This will allow the iPad to be offered on AT&T and Verizon simultaneously, instead of producing two separate models. Digging deep into iOS 4.3 beta code also reveals a bunch of new iPad models: iPad2,1, iPad2,2, iPad2,3 refers to next-gen Wi-Fi only, GSM and CDMA iPad 2 models respectively. Numerous reports surfaced in the past few months have clearly indicated existence of two cameras, one on the front for FaceTime and one on the back for stills and videos. With so many new Android tablets on the way this year, it’s all the rage these days to use multi-core CPUs on new slates, but according to reports, Apple will be going one step further by including a Dual-Core GPU too. AppleInsider reports that the new bespoke processor to be used in the iPad 2 will include a SGX543 GPU, bringing improved graphics performance and improved power-consumption rates. Reports also suggest a Dual-Core CPU made by Samsung, running at 1.2GHz will be included, with Apple pairing the new chip with 512MB of RAM. Remember those gestures Apple added to the iOS 4.3 Betas for switching and closing apps? Boy Genius Report received a tip that the iPad 2 will finally realize Steve Jobs’ hopes of removing all buttons from the company’s hardware. Instead of a home button, users will use multi-touch gestures to navigate the basic OS functions. 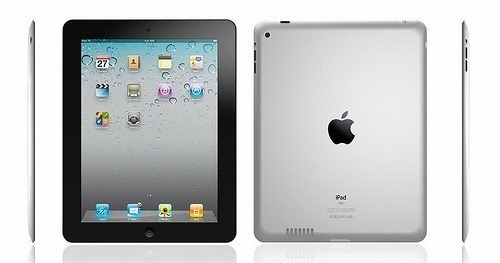 Gruber Claims iPad 3 on the Way too! My personal favorite amongst the plethora of claims and counterclaims about what will and won’t be in the iPad 2. As if speculation on the next generation iPad 2 wasn’t enough, John Gruber saw fit to add a little fuel to the fire – by claiming Apple will be announcing the iPad 3 as early as this September! Believed to be more iPad 2.5 than 3, little is known about the device, perhaps due to it living in Mr Gruber’s imagination only. Of course, I’ll be the first to eat my hat (or another hat of John’s choosing) if we’re seeing a third-gen iPad in a few short months. So there we have it, a short roundup of the rumors currently doing the rounds on the internet. There are many, many more than the few I’ve chosen to cover here – some more likely to come to fruition than others. With the iPad 2 still not announced though, be sure to watch this space for more juicy gossip as and when we get it!